For the longest time, a small SUV has been a fashion statement. “You’re not worthless,” they shouted. “You’ve amounted to something.” “Your parents aren’t ashamed of you.” That’s because you moved to the suburbs, got a house, and the small SUV. The 2018 Volvo XC40 seems to be the first one made for the rest of your life. The XC40 is huge—not for you, but for Volvo. It’s actually rather competitively sized for a small-to-medium-size crossover-SUV-ish family-hauler thing. But for Volvo, it’s bit of a make-or-break. It’s the first truly small SUV the company has ever made. It’s the first of its scalable CMA platform, a totally separate engineering project from the SPA platform that underlies its XC90 and XC60 SUVs and the S90 sedan. The bulkhead and the position of the front wheel are pretty much the only thing that are fixed. Everything else—the wheelbase, the height, the overhangs, everything that makes a car a car—can all be moved around. So it’s fair to say that there’s much more in the works. But the 2018 Volvo XC40 is a hell of a start. That’s not to say that cars like the BMW X1 and Mercedes GLK aren’t made for your life at all—they’ve got four wheels and tires, and a steering wheel, and they generally get you to where you need to go with some level of Status. But as we’ve seen, the Volvo XC40 just seems to be designed by Swedes who watch us live, and it’s genius. Volvo moved the traditional door speakers up by the firewall, specifically to allow a 15-inch laptop to go in the door pocket that most manufacturers are still designing for maps. There are little slots on the left hand side of the steering column to store credit cards or a drivers’ license, which are definitely things you remove from your wallet before sitting down to a spot of driving, or maybe a parking ticket or something, if that’s a thing you really need on a daily basis. 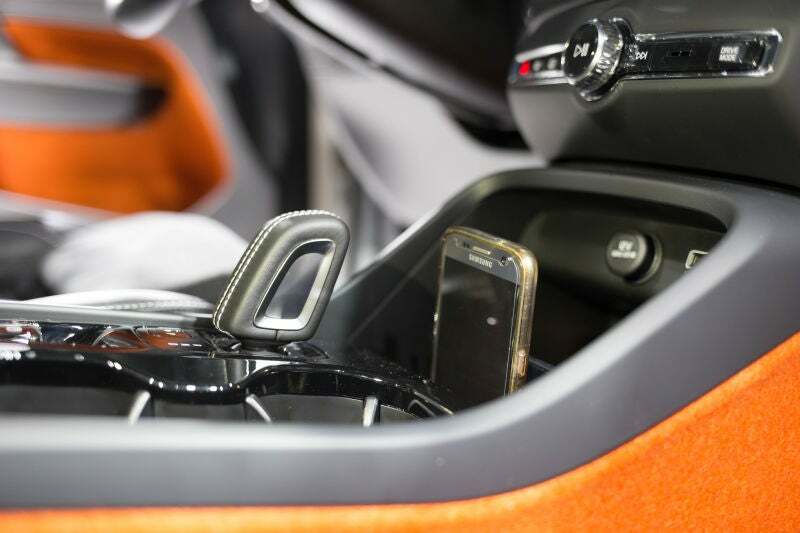 There’s also a little slot that’s just perfectly sized for a cellphone, though a Volvo product manager did admit to me that it was more a result of the slot being designed for the ashtray in European models. There are little hooks placed hither and yon, including one on the glove box lid that helpfully reminds you that it’s maximum weight limit is two kilograms (about 4.4 pounds for us Americans), though if you go over that it just snaps off, and you can easily re-attach it. It’s the most IKEA-fied car they’ve made yet. Volvo engineers helpfully pointed out that it was designed with takeout orders in mind, though it feels like Volvo is just ever-so-slightly judgmental about my regular 17-pound Thai food orders. The trunk also has a little flip compartment for extra storage, and when you lift up the flap, it’s also got little hooks for grocery bags if you need to keep things upright. The center console is also perfectly sized for a tissue box, which Volvo says is very important for the Chinese market where people like to always keep some tissues with them (probably smart, anyways). So if you need to use the restroom, you know, you can do that. All that being said, this little rubber Swedish flag attached to the side of the clamshell hood is pretty neat. I know this is a car enthusiast website, and I do fancy myself something of a “real car-driving man,” but frankly, this is going to be short. It drives like a small-to-midsize family SUV. The steering is a bit dead on-center, but while it is the tallest SUV in its class, it’s got springs on the firmer side that keep everything from wallowing. We were only able to drive the four-cylinder turbocharged T5 all-wheel-drive model, that comes complete with 248 horsepower and 258 pound-feet of torque and an eight-speed transmission. Zero-to-60 mph is estimated by Volvo and a not-too-shabby 6.2 seconds, with the car heading onto a claimed top speed of 140 mph, but it never felt astoundingly quick. Adequate, sure, and passing is by no means no problem, but as Volvo re-iterated a few times, you’re high up from the road, so you never feel as if you’re quite storming around. It’s got McPherson struts upfront and a four-link setup with a sway bar at the rear, and Volvo’s premium “R-Design” trim comes with stiffer springs and dampers. Truth be told, however, Volvo’s choice of locale for the press launch had nothing but the smoothest roads in the world. The only bumps we ever hit were low-speed speed bumps, so it’s not like you could ever get a proper feel for the suspension setup. Wait for the week-long test, I suppose. If you’re really feeling crazy, feel free to throw it into dynamic mode, which adds MORE DYNAMISM. And by that, I mean it stiffens up the steering, stiffens up the brake pedal, changes the accelerator pedal mapping, and sends more power to the rear. How much power? Volvo wouldn’t really say, though its engineers did admit the system was front-biased. Get nuts, though, and it’ll send as much as 100 percent of the power to the rear. Later in the summer of 2018, a “T4" variant will debut with 185 HP, and front-wheel drive, though we didn’t get to drive it. Oddly enough, it doesn’t really have that much different of an engine from the T5. It’s the same 2.0-liter turbocharged four-cylinder mill, but it’s just got a smaller turbocharger attached. I suppose that’s useful for keeping parts costs low or something. Volvo says there are a bunch of “electrified” options coming, so expect to see some hybrid variants and even a fully electric version in the future. Those should be pretty good. 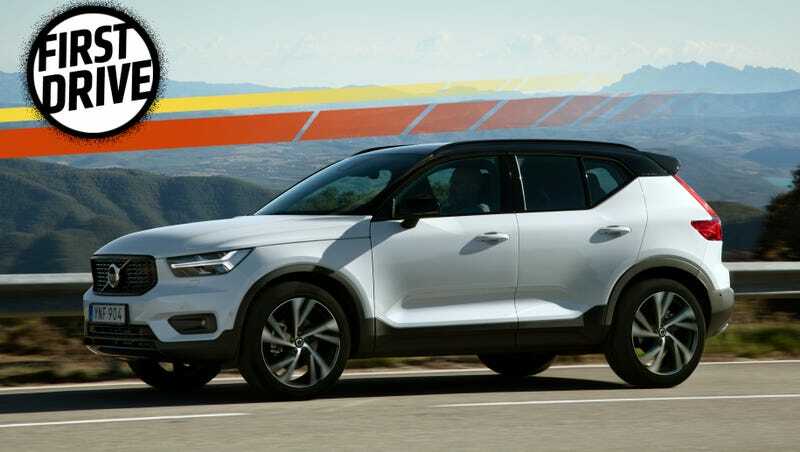 So you’ve read all this blather, and now you’ve decided to get a Volvo XC40. Cool, good for you. You can buy it and you can lease it, just like any other car, starting March 2018. Or you can do Care By Volvo. There’s probably going to be some sort of name worked out for this type of deal that’s better than the clunky “Care by Volvo,” but for the moment, I can’t seem to think of a better deal in cars. You sign up for two years, and that’s it. That sounds like an absurdly good deal, when you consider how much a car, insurance, and maintenance costs in most states. And even better, the insurance isn’t tied to a particular driver, it’s tied to the car. So whoever you want to drive it, can drive it. And Volvo really means “whoever.” The XC40 comes with a “digital key.” Basically, you download the Volvo app on your phone, whoever you want to drive your car downloads the Volvo app on their phone, and you just send them a virtual key to your car. They hop in, and drive away. Doesn’t matter if it’s your friend, your spouse, your kid, some guy you just met on the street who only has the slightest amount of drool and/or blood pouring copiously from his mouth. They’re covered, and they can have the keys to your car if you want them to. I thought there had to be some sort of catch. There was no way, in my mind at least, that anyone could be making money off this deal. So I called up Liberty Mutual to ask, and it turns out, Volvo’s the one eating the cost here. Liberty Mutual still reserves the right to reject a driver for the Care by Volvo program, Liberty Mutual spokesperson April Scoville told me over the phone. And while she couldn’t get into specifics over who would be rejected (though you probably won’t get a chance to enter the program if you’ve got, say, 12 DUIs in the past six months) or if you could find yourself ejected from the program after crashing your Volvo for the seventh time in two days, citing the nature of varying personal cases and state-by-state laws, she did say that the huge variable costs are actually entirely eaten by Volvo. In other words, Liberty Mutual is charging its usual insurance rates, and then Volvo is the one passing the flat fee onto you. So if Volvo ends up with a bunch of MANIACS on their hands, they could find themselves losing money hand-over-fist on this whole setup. But if Volvo drivers stay Volvo drivers? Well, then they could end up doing pretty well. Do you really care though? You don’t own Volvo, probably. You are just a car-driver. And here you pay $600 a month, and you get a very lovely mid-size SUV worry-free. Okay, so it’s more like a lease than true ownership, but it’s not such a bad deal. If I was paying $600/month on my car, I’d jump at the chance for that. Especially when you consider the base T4 FWD model starts at $33,200, and for a T5 AWD model like in the program, you’re looking at $35,200 at the very least. And with Volvo sure to roll out the program across its rapidly expanding lineup, I’d probably be jumping at something Swedish soon. What Do You Want To Know About The 2018 Volvo XC40?